The pharmaceutical industry is comprised of companies engaged in researching, developing, manufacturing and distributing drugs for human or veterinary use. New drugs have an enormous positive influence on global health, prosperity and economic productivity by saving lives, increasing life spans, reducing suffering, preventing surgeries and shortening hospital stays. Advances in medicine have eliminated deadly diseases and have brought other life-threatening conditions under control. Drug therapy is now an integral part of nearly every facet of healthcare, and new breakthroughs promise to revolutionize the treatment of non-communicable diseases. The growth potential of the Sri Lankan healthcare industry is very positive. Alaris with its vast knowledge of the market, strong sales and distribution network and efficient working capital management is all poised for growth. Sri Lanka has the fastest ageing population in South Asia, People above the age of 60 are estimated to be over 1/5th of the population by 2030. An ageing population and increased longevity will create new demand for therapeutic geriatric products. We at Alaris alongside our partners will ensure through latest innovations & research that we continue to introduce valuable new products to the market, to keep growing in the industry. Nutraceuticals is a broad umbrella term that is used to describe any product derived from food sources with extra health benefits in addition to the basic nutritional value found in foods. Nutraceutical product is a food or fortified food product that not only supplements the diet but also assists in treating or preventing disease (apart from anemia), so provides medical benefits. Nutraceutical has advantage over the medicine because they avoid side effect, have naturally dietary supplement, etc. Nutraceutical; on the basis of their natural source, chemical grouping, categories into three key terms -nutrients, herbals, dietary supplements, dietary fiber, etc. The most rapidly growing segments of the industry were dietary supplements and natural/herbal products. Nutraceuticals are not tested and regulated to the extent of pharmaceutical drugs. The word nutraceutical is combined from the words nutrition and pharmaceutical. Increased life expectancy, globally, has led to an increase in the incidence of lifestyle (age related) diseases such as diabetes, high blood pressure and cholesterol, obesity etc. As a result, there has been a significant increase in the deaths due to lifestyle diseases worldwide. Consumers worldwide are looking to follow healthy lifestyles to obtain optimum nutrition to keep these diseases at bay, leading to an increase in nutraceutical consumption by health conscious consumers. Globally, US and Japan are the most developed markets for nutraceuticals, due to the consumer acceptability achieved in these regions. India, China and Brazil are developing nations which show huge potential for the nutraceuticals market. The definition of nutraceuticals and related products generally depends on the source. They can be classified on the basis of their natural sources, pharmacological conditions, as well as chemical constitution of the products. Most often they are grouped in the following categories: dietary supplements, functional food, medicinal food and pharmaceuticals. A dietary supplement represents a product that contains nutrients derived from food products, and is often concentrated in liquid, capsule, powder or pill form. Although dietary supplements are regulated by the Local and international authorities such as FDA as foods, their regulation differs from drugs and other foods. According to their generally accepted definition, functional food is a category which includes whole foods and fortified, enriched or enhanced dietary components that may reduce the risk of chronic disease and provide a health-benefit beyond the traditional nutrients it contains. Medical food is formulated to be consumed or administered internally, under the supervision of a qualified physician. Its intended use is a specific dietary management of a disease or condition for which distinctive nutritional requirements are established by the medical evaluation (on the basis of recognized scientific principle). Pharmaceuticals are medically valuable components produced from modified agricultural crops or animals. The term is a combining of the words “farm” and “pharmaceuticals”. Proponents of this concept are convinced that using crops (and possibly even animals) as pharmaceutical factories is much more cost effective than conventional methods, with higher revenue for agricultural producers. Our cutting-edge, consumer-and-scientifically relevant nutraceutical ingredients add a powerful edge to your brands. Today’s consumers are becoming more health and image-conscious than ever. Our family of nutraceutical products enables the consumers perform at their peak – as well as coping with future health concerns - like cardiovascular disease and weight management. Our nutraceutical fit easily into people’s daily diet and offer positive, lifestyle-oriented wellness and nutritional benefits. That means feeling and looking good. Herbal nutraceutical is used as a powerful instrument in maintaining health and to act against nutritionally induced acute and chronic diseases, thereby promoting optimal health, longevity, and quality of life. Nutraceutical domestic market is valued at over US$ 140 million, with an annual growth of around 12%. 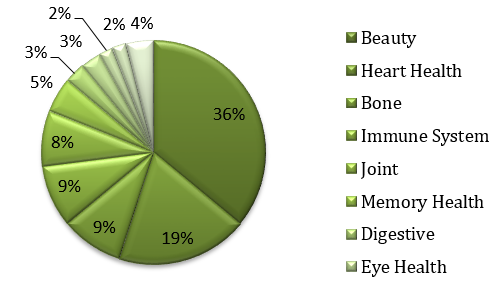 The leading Nutraceutical market areas are Beauty segment, Heart, health and Bone. Other growing areas are Immune system, joint, memory health, digestive, eye health, and menopause. Key drivers of the nutraceutical segments such as Increasing Consumer Health Awareness and Increased Co-Prescription with Regular Drugs leads to overcome the upcoming constraints such as High Markup & Market Skimming Practices, Lack of Regulatory framework to Validate Health Claims and Inadequate Investment in Research Sectors. Over the years nutraceuticals have attracted considerable interest due to their potential nutritional, safety and therapeutic effects. They could have a role in a plethora of biological processes, including antioxidant defenses, cell proliferation, gene expression, and safeguarding of mitochondrial integrity. Therefore nutraceuticals may be used to improve health, prevent chronic diseases, postpone the aging process (and in turn increase life expectancy), or just support functions and integrity of the body. They are considered to be healthy sources for prevention of life threatening diseases such as diabetes, renal and gastrointestinal disorders, as well as different infections. A wide range of nutraceuticals have been shown to impose crucial roles in immune status and susceptibility to certain disease states. They also exhibit diseases modifying indications related to oxidative stress including allergy, Alzheimer's disease, cardiovascular diseases, cancer, eye conditions, Parkinson's diseases and obesity. The key heath benefit of using nutraceutical products can be summarized as follows. May increase the health beneficial effect. May have naturally dietary supplement, so do not have unpleasant side effect. May increase the health value, our diet and improve medical condition of human. May easily be available and economically affordable. Alaris provides following product range in Sri Lankan market. Alaris provides following product range in Sri Lankan market and the respective product description can be found in the products page.